Several months ago, I went to a class – “Sharpening Your Senses” – at the Institute of Culinary Education. We discussed how comfort food has nothing to do with haute cuisine or, indeed, any sort of quality; comfort food evokes memories and emotions, in spite of the sometimes dubious origins of the food. Take macaroni and cheese. I’ve made Ina Garten’s ultra-luxurious homemade version with the crispy bread topping, and I swooned when I ate it. But it will never work for me on a chilly winter’s day or cheer me up on a rotten day like a box of the original Kraft macaroni and cheese (or Kraft cheese and macaroni, for those of you old enough to remember that). I remember how grown-up I felt the first time my mom let me mix in the cheese powder, milk, and butter by myself, and I remember the delight in taking a “test bite” off the end of the wooden spoon. I also remember how my mom would change it up sometimes and add cooked hamburger, though I don’t know if she did this for added nutrition, or because she was bored with the plain version, or both. I don’t make the hamburgerized version now, but I still make boxed macaroni and cheese for Kiddo (granted, it’s Annie’s Organic these days) and I let her stir the ingredients together. She’s never been interested in taking a “test bite” but she giggles when she sees me doing it. Old habits die hard. 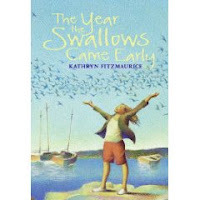 I was reminded of all this while reading The Year the Swallows Came Early by Kathryn Fitzmaurice (Bowen, Feb. 2009). Eleanor “Groovy” Robinson plans on going to culinary school and becoming a chef when she grows up. That is until her loving but irresponsible father gambles the money away that was being saved for her education. Convinced there must be some confusion and wanting earn extra money, Groovy begins selling chocolate-covered strawberries at the nearby store that her friends own. However, when Groovy comes to terms with what her father has done, she sinks into a depression and gives up cooking and baking. Her mother and her friends try to snap her out of it with no success. When the swallows return to their California town and her friends rally together, Groovy is able to see people for who they are and come to terms with the changes around her. Groovy’s life comes into full focus and she knows what she must do. First and foremost this is a story about forgiveness and the idea that, if you never forgive anyone, the anger “will turn you to stone.” It’s also a coming-of-age story and we experience Groovy’s changing relationships with her mother and father as she matures. Lastly, this is a lovely friendship story – Groovy’s friends are the lifeline that gets her through difficult times, and one gets a sense of this beach community’s strong ties to each other. In many ways, I was reminded of Polly Horvath’s writing while reading this, particularly My One Hundred Adventures (but without the pseudo-magic-realism): it’s quiet, sweet, introspective, quirky. I don’t read a lot of reviews that mention a book’s mood but, like Horvath, Fitzmaurice does a fantastic job of setting up the ambience of the story. In the case of this book, the mood was slightly melancholic with lots of hope woven throughout, which is exactly the type of book I like to read in the autumn and winter. I only had one minor quibble with the story. Groovy’s mother is really into astrology (“I wonder what sign Betty Crocker is,” Mama said one day. “I bet she’s a Pisces.”). I found this interesting and enlightening, as Groovy’s mother is the grounded one in the family; the feeling is that she is the responsible one because she has to be and astrology is her foray into something more cosmic and creative. Or her way of making sense of things. Not to mention that the astrology comments peppered throughout the story provide some light humor, particularly if the reader knows basic astrological traits. So I was confused and, I must confess, a bit disappointed when Groovy’s mother forsakes this at the end of the book. Instead of reading her horoscope in the paper, she goes to church with Groovy. Why couldn’t she consult her horoscope and go to church with Groovy? Why must it be one or the other? I didn’t understand the necessity of making this change in the mother’s character, and it just tweaked me a bit. Overall, the book is cozy and lovely…just as your favorite helping of comfort food should be. From a librarian’s perspective, it’ll need to be booktalked: the title and cover are vague enough that a kid won’t know what the book is about just by looking at it. Nevertheless, for those quiet, more serious readers that go for more character development rather than plot-driven storylines, this will be a perfect match. They’ll be sure to connect with Groovy on multiple levels.